We will pick you up between 04:00 hrs and 04:40 hrs from your hotels or accomodation places. Then we will take a local bus towards Mollepata, small town located over 2,850 m.a.s.l., with a tempered climate and vegetation from the Edge of the Jungle, in its surroundings we will be able to appreciate some snowcapped picks that belong to the chain of Salkantay, where we will enjoy the beautiful sight that is part of the snowcapped pick Salkantay which is at an altitude of 6,200 ms above sea level., contemplating this landscape we will begin our long/p> walk which will approximately last 7 to 8 hours. Likewise, we will observe the vegetation pertaining to the Edge of the Jungle, along the road we will have lunch, and then we will continue until we get to SORAYPAMPA, place of our first camping site. At dawn, when we wake up our first sight will be the impressive of the majestic Salkantay. At 07:00 hrs. we will get ready to have breakfast and after that we will continue our trek, also, this time will take us 7 to 8 hours. Along our walking we will be able to observe the echo tones and the differences among the altitudinal floors, we will enter into a kind of canyon which will lead us to the to the foothills of the Salkantay, after 3 hours walking we will have lunch, to keep on our walking we will have to get through this pass in order to descend and contemplate the Edge of the Jungle. This day, we will arrive to CHALLHUAY where we will spend the night. of birds, mammals, insects and other animals. Moreover, we will have the opportunity to observe the life of the settlers and enjoy of the thermal baths (collpampa), the rainfalls (waynapoco), if we really have some spare time. Then, we will continue walking for about 4 a 6 hours before lunch(sahuayacu o playa), next we will take the bus to get to Santa Teresa where we will spend the night. Waking up we will have breakfast and after it, we will walk for about 40 minutes to get to the edge of the river VILCANOTA, here we will have to use thehanging bridge after which we will walk for 3 more hours towards the Hidroelectrica, once there, we will be able to appreciate the valley of the Urubamba river, a huge rainfall that flows from the Machu Picchu mountain, on the northeast we will find an appropriate place where we can have lunch. Afterwards, visit the Intihuatana at Km. 121 (Small archaeological rest). At the end we will hike the hydroelectric to Aguas Calientes. 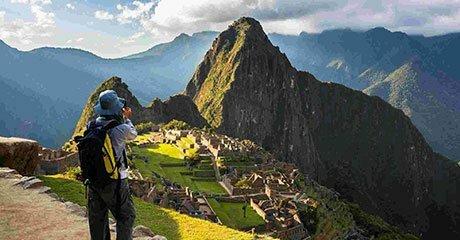 Today is the great day because we will be able to know the Historical Sanctuary of MACHU PICCHU. At 06:00hrs we will get ready to hike towards MACHU PICCHU, where we will have a guided tour.